The field for the G3 Sydney Stakes (1200m), which provides the emergencies for The TAB Everest, is promising to be an outstanding race itself. Trainer Greg Hickman confirmed that Pierata will be running, dropping back from the mile of the Epsom Handicap where he ran ninth. “We’ve kept him fresh since the Epsom and the blinkers will go on,” said a very bullish Hickman. Osborne Bulls, English, Invincible Star, Music Magnate, Kaepernick, Spright and Burning Passion are all pencilled in for the $500,000 race. Mick Bell is also likely to send Jungle Edge to Randwick, eyeing off a wet track with the eight-year-old warrior. Meanwhile, Kris Lees, who will saddle up Le Romain, In Her Time and three-year-old Graff in The TAB Everest, will be represented by Tactical Advantage, Clearly Innocent and Dal Cielo in 'The Everest consolation'. As for the $500,000 G3 Craven Plate (2000m), Chris Waller’s racing manager Charlie Duckworth said Who Shot Thebarman, Comin’ Through, Egg Tart and Shillelagh are among those being considered for the race. Punters Intel reveals Aylmerton set a hot pace in the $300,000 G2 Polytrack Roman Consul Stakes (1200m) running his first 600m in 34.71s, allowing Sesar to rattle home in a final 600m of 34.39s, which was 4.5L superior to the next best Sandbar, who was typically brave running second. “At the 600m I thought as long as I get clear air I’ll be pretty hard to beat here," said Jason Collett. “It was just a matter of keeping up to them early and getting on the back of Corey (Sandbar) he got the saloon passage." Trainer Steve O’Dea had his first Sydney winner earlier with Doubt Defying, and that turned into a double with Sesar. “He’ll go to Melbourne now. 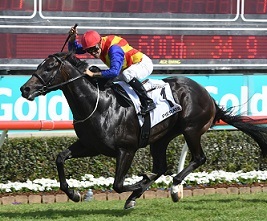 Being a colt there were thoughts of going to the Coolmore but with the run under his belt he could be run off his legs so there is the Gothic at Caulfield over 1400m and then Carbine Club Stakes,” said O’Dea. Adrian Bott has lost none of his faith in Thinkin’ Big after the race favourite was rolled in the $500,000 Moet & Chandon G1 Spring Champion Stakes (2000m). "Second up over 2000m on a wet track probably too its toll. He didn’t have the grounding some of the others in the race,” said Bott. Maid Of Heaven got the better of Aramayo at the finish with Thinkin’ Big 2.5 lengths back in third. Jockey Tim Clark echoed Bott’s thoughts, almost to the exact word! “Outside of the leader second up at 2000m on a soft track might have taken it’s toll but I was still proud of his effort,” said Clark. Thinkin’ Big leads the field out for the Group 1 Spring Champion. How hot of a race in the Kingston Town Stakes! It’s winner Avilius maintained his unbeaten record in Australia at Flemington with the second and fourth-placed horses Brimham Rocks and Patrick Erin running one-two in the G1 Metrop last week. I Am Serious added to the depth of the race taking out the $160,000 G3 Harrolds Angst Stakes (1600m) with punters sending the mare around a heavily backed $1.80 favourite. “The 2000 metres back to a mile suited her, as did the ground, she’s very good on a wet track,” said Charlie Duckworth, Chris Waller’s racing manager. James McDonald took extra satisfaction from the win, with I Am Serious being one of his first winners back from his suspension, back in May this year. “It is a credit to the team and the mare, she turns up every time and delivers the goods rain, hail or shine,” said McDonald. Tim Clark is counting down the days to ride The TAB Everest hopeful Shoals. The hoop stopped short of suggesting the four-year-old is the horse to beat but it's easy to get the impression he certainly wouldn’t be swapping her for any other runner. “She’ll be right in the firing line as one of the main chances,” said Clark. “She ran very well last week against a fair chunk of the field. Her run was excellent and she went into the race with a little bit of improvement considering The Everest was two weeks away. “I’m confident she’ll run extremely well. I don’t think there is a lot between those at the top of the market though. It’s just going to come down to luck in running, track conditions, the little things. As far as tactics go, Clark suggested the mare is more explosive when ridden patiently. “If anything, first up I rode her too close and she was off the bridle a fair way from home in a fast race. The other day they went quick but I was a bit further back and was able to travel into it. She ran through the line strong and will appreciate any give in the ground,” said Clark.